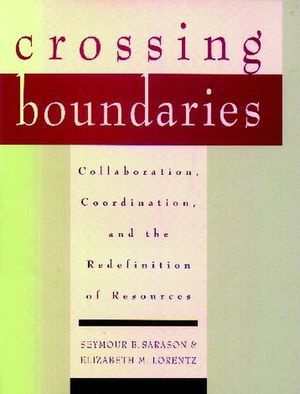 Once again, Sarason leads the way, with a unique and provocative perspective on organizational collaboration. In this penetrating work, Sarason and Lorenz tackle the problem of decreased in schools and health and social service agencies. They show how collaboration between organizations can work, and how this pooling of resources can add up to more than the sum of parts. The authors the role of networks for maximizing the use of resources, the special role and characteristics of a network coordinator, and the energy and sense of community that will result. SEYMOUR B. SARASON is professor emeritus in the Department of Psychology at the Institute for Social and Policy Studies at Yale University. He is the author of numerous books including The Predictable Failure of Educational Reform and the Case for Change, both from Jossey-Bass Publishers. ELIZABETH M. LORENTZ supervises new coordinators of resource exchange networks in the New York metropolitan area. She also brings network concepts to bear on organizations on whose advisory board she serves, including the Institute for Responsive Education, the Bank Street College of Education, the College for Human Services, the Rene Dubos Forum, and the Public Education Association.